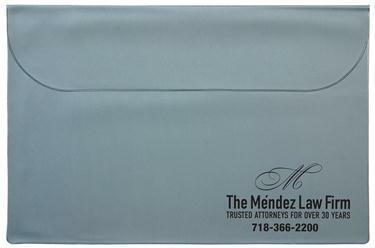 This vinyl folder is available in nineteen colors (Gray shown above). 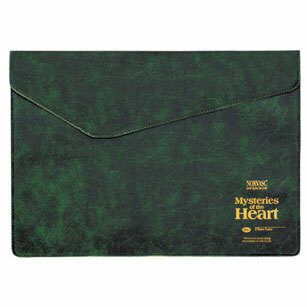 The 15" X 10" size is large enough to hold letter or legal size documents. Add 15 cents each for translucent colors (eight available). Add 45 cents each for velcro closures. 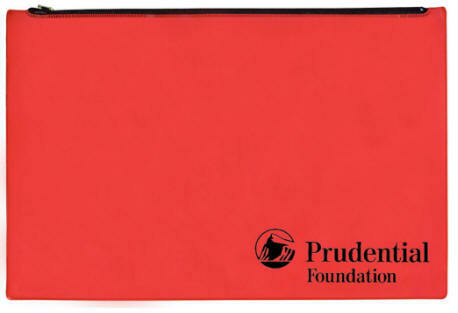 Add 55 cents each for three sided business card pockets. The imprint area is 4" wide by 5" high. There is no set-up charge for up to five lines of straight copy but there is a $65.00 set-up charge for logos or special designs. Item size: 17" wide by 11 3/4" high. Colors: red, navy, maroon, gray, white, green, black, and blue vinyl. Imprint size: up to 4" wide by 5" high. There is a set-up charge of $65.00 on new or repeat orders for straight copy as well as for logos or special designs. Large silk screened imprint available at extra cost. Item size: 16" wide by 12" high. There are 4 colors of standard vinyl available and 11 colors of executive vinyl. There is a die charge of $65.00 on new orders for logos. No die charge for straight copy up to five lines. Imprint area: 4" wide by 5" high in lower right corner. Add 45¢ for velcro closure.